Transporting sperm is big business, with many people taking part in the process each day. 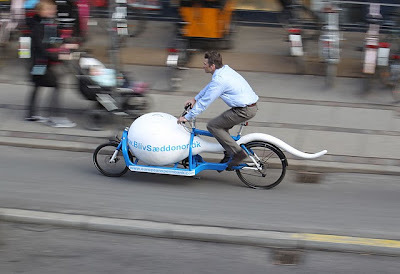 The clever Danes are at it again, and this time they have devised a transportation mechanism that is both quick, reliable and environmentally friendly. They have released the Sperm Bullitt. 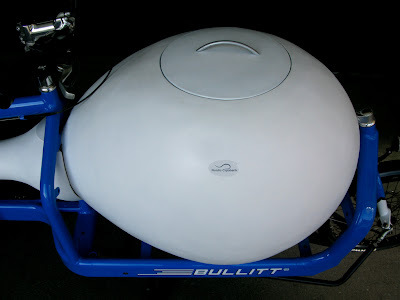 Much like an actual sperm, where the head contains most of the "important stuff", the Sperm Bullitt stores all its' sperm in its' head. A head, which just happens to be a customed designed cooling compartment for transporting sperm cansisters in. It's unclear whether there are any powerpacks within the neck region, but it would sure help the Sperm Bullitt stay consistent with basic sperm anatomy. The tail in this case, probably offers little in the way of a similiar function to it's biological basis.